Description: The Exegetical Guide to the Greek New Testament (EGGNT) closes the gap between the Greek text and the available lexical and grammatical tools, providing all the necessary information for greater understanding of the text. The series makes interpreting any given New Testament book easier, especially for those who are hard pressed for time but want to preach or teach with accuracy and authority. Each volume begins with a brief introduction to the particular New Testament book, a basic outline, and a list of recommended commentaries. The body is devoted to paragraph-by-paragraph exegesis of the Greek text and includes homiletical helps and suggestions for further study. A comprehensive exegetical outline of the New Testament book completes each EGGNT volume. 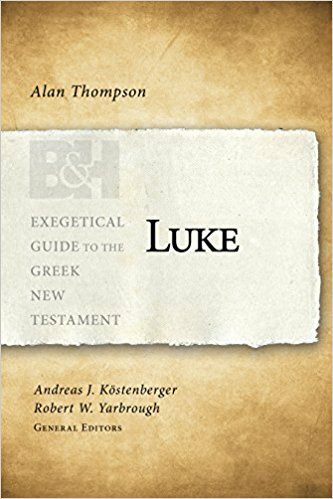 Citation: David Lertis Matson, review of Alan J. Thompson, Luke, Review of Biblical Literature [http://www.bookreviews.org] (2019).